Wireless network is a network set up by using radio signal frequency to communicate among computers and other network devices. Sometimes it’s also referred to as WiFi network or WLAN. This network is getting popular nowadays due to easy to setup feature and no cabling involved. You can connect computers anywhere in your home without the need for wires. 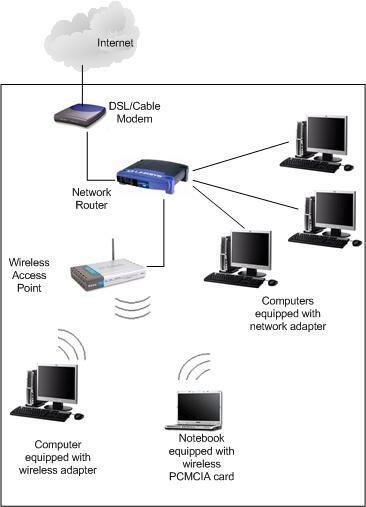 Here is simple explanation of how it works, let say you have 2 computers each equipped with wireless adapter and you have set up wireless router. When the computer send out the data, the binary data will be encoded to radio frequency and transmitted via wireless router. The receiving computer will then decode the signal back to binary data. It doesn’t matter you are using broadband cable/DSL modem to access internet, both ways will work with wireless network. If you heard about wireless hotspot, that means that location is equipped with wireless devices for you and others to join the network. The two main components are wireless router or access point and wireless clients. If you have not set up any wired network, then just get a wireless router and attach it to cable or DSL modem. 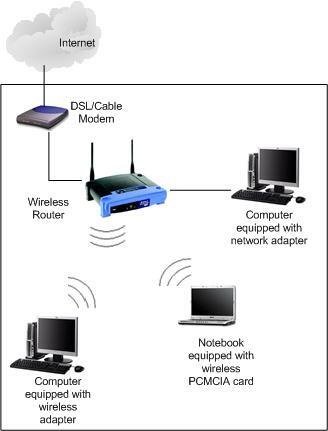 You then set up wireless client by adding wireless card to each computer and form a simple wireless network. You can also cable connect computer directly to router if there are switch ports available. If you already have wired Ethernet network at home, you can attach a wireless access point to existing network router and have wireless access at home. Wireless router or access points should be installed in a way that maximizes coverage as well as throughput. The coverage provided is generally referred to as the coverage cell. Large areas usually require more than one access point in order to have adequate coverage. You can also add access point to your existing wireless router to improve coverage. The IEEE 802.11 standards specify two operating modes: infrastructure mode and ad hoc mode. Infrastructure mode is used to connect computers with wireless network adapters, also known as wireless clients, to an existing wired network with the help from wireless router or access point. The 2 examples which I specified above operate in this mode. Ad hoc mode is used to connect wireless clients directly together, without the need for a wireless router or access point. An ad hoc network consists of up to 9 wireless clients, which send their data directly to each other. Click here to learn more on this ad hoc mode.